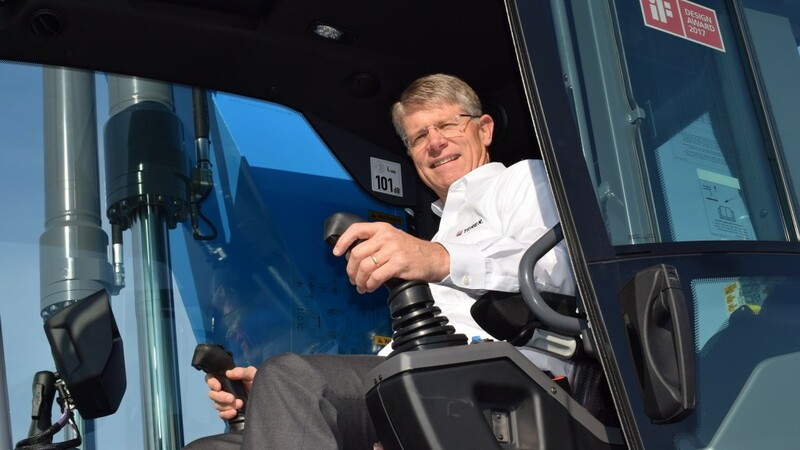 John Garrison, Terex CEO and president in Fuchs' award-winning material handler operator's cab. Over the last 130 years, Fuchs has gone above and beyond in its product development efforts, focusing on what customers need to be successful in their industries and applications. Fuchs innovations change the market and set the standard for quality, reliability and safety in the material handling industry—recently illustrated when the new Fuchs cab was awarded the IF Design Awards. First established in Germany, Fuchs today has a truly global presence. Dominik Vierkotten, Fuchs Managing Director, said "We are increasing our market penetration through investments in service, support and sales specialists. Since 2016, we have 10 newly appointed distributors in the United States, and we have recently sold seven material handlers into Lumut Port—Malaysia's biggest dry bulk jetty." Over 300 customers, distributors and team members from around the world recently joined Fuchs in Bad Schonborn, Germany for a three-day celebration marking Fuchs's 130th Anniversary. Key to the Fuchs brand success is the global distribution network, operating globally while providing local service and support service to customers. Jason Templeton, Vice President Company Wrench, said "We are proud to be part of the Fuchs success story and to see the passion and dedication that exists in the brand. We are excited about our future with the Fuchs business in the U.S. and the new products and options that are coming." The anniversary celebrations consisted of presentations, machine demonstrations, one-on-one meetings with Fuchs experts and exciting machine launches. Attendees were treated to a first-look at the new MHL 375 material handler that will be officially launched at bauma 2019. Check out our wrap up video to capture the highlights from the event.